Make the most of this great & veterinarian cutlets with tamarind sauce & yogurt. Heat a pan with a 3 tsp oil, add mustard & cumin seeds & let them crackle. Add green chilies , ginger-garlic paste & onion in it, when it turn to brown color add turmeric , salt, then add peas & smashed potato. mix it well . add 2-3 tsp besan & let the mixture cook for 5 min.finally add chopped coriender & remove it from fire & allow it to cool. Meanwhile, in another heated pan make a gravey of tomato & onions & simmer the kabuli chane in it. In one bowl mix suji & 4 tsp besan, add salt, red chilly & turmeric powder in it. by adding water make a thin batter of it. Heat a nonstick flat pan or tava, sprinkle oil on it. dip the flatten balls in a batter & shallow fry them on pan. use oil to fry them properly. repeat the procedure for all the balls. While serving take 2 cutlets in a plate with a spoonful kabuli chana , spread a spoonful yogurt on it, drizzle turmeric sauce, then add spoonful chopped onions & barik sev, coriender leaves for each person . if needed sprinkle salt & pani puri masala on it. This is really mouth watering snak gives a taste of chaupati, children loves it very much. I used cornflour instead of besan to the potato mixture, this makes the cutlets crispy when frying. Still its a good and tasty recipe. Thanks. 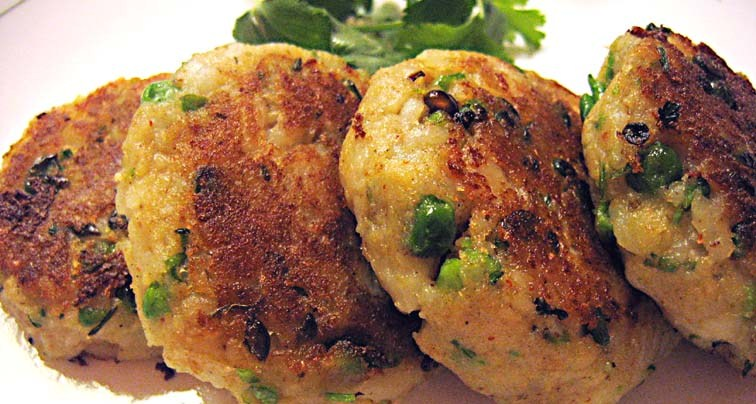 kirti,I love all your recipes and this mouth watering cutlets are really very very good.thanks alot. Hey Kirti it sounds yummy. I like all your recipes. Thanks for sharing with us. looking nice i gona try it today. hi urooj,soji means Rawa, generally used for making shira. thanks hardeep! surely try it & let me know the result.